Anonymous sale; Lepke, Berlin, 24 February 1903, lot 83, as J. Verspronck (to Schwerseur?). Anonymous sale; Hôtel Drouot, Paris, 15 June 1903, lot 53, as Verspronck (FFr. 5,000). with Pieter de Boer, Amsterdam. with Schaeffer, Berlin, as Cornelis de Vos. E. Greindl, Corneille de Vos. Portraitiste flamand (1584-1651), Brussels, 1944, p. 132, as Cornelis de Vos. Old Master Paintings: An illustrated summary catalogue, Rijksdienst Beeldende Kunst (The Netherlandish Office for the Fine Arts), The Hague, 1992, p. 90, no. 656, illustrated, as Pieter Dubordieu. Zwolle, Provinciehuis Overijssel, on loan. 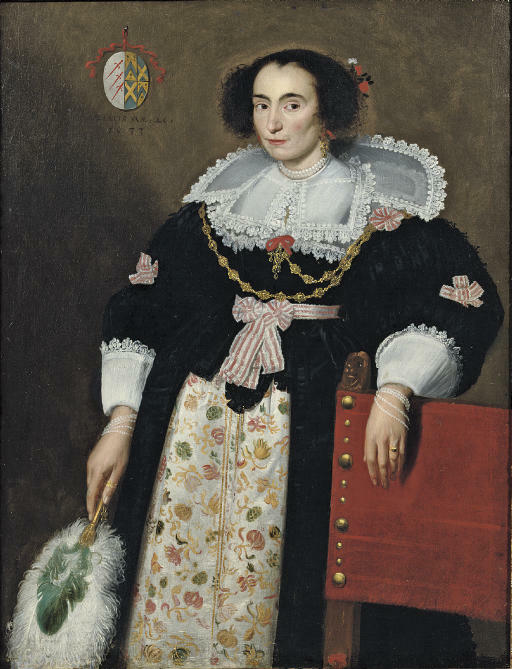 The sitter has been identified as Anna van den Bogaerde by means of the coat of arms in the upper left corner. She probably died in Bruges in 1641. Her costume is uncharacteristically colourful for a portrait of this time. However the garments themselves are consistent for the date of the work. She wears a black gown, caught at the waist and elbows with red-and-white striped ribbons and rosettes. This is over a black bodice with a high waist. Below this is a skirt made of white silk covered with brightly coloured embroidery of flowers. She wears a complex collar, consisting of a so-called neerstik directly over her décolletage, and over that a linen collar trimed in lace that stands up partly behind her head. Her jewellery consists of strands of pearls at the wrists and neck; a gold chain; gold dangling earrings trimmed with red ribbon; rings on left ring finger and right thumb. In her right hand, she carries a feather fan. The high waist and somewhat bulbous silhouette is typical for the first half of the 1630s; so, too, are the fluffy tufts of hair at the sides of her head that echo the round shape of her sleeves. Rudi Ekkart of the RKD, The Hague, believes the painting to be from the Southern Netherlands. Previous attributions for the picture have included Pieter Dubordieu (L'lle-Bouchard 1608-1678/98) and Frans Denys (Antwerp c. 1600-1670 Mantua). We are grateful to Dr. Emilie Gordenker of the National Galleries of Scotland, Edinburgh, for her help in cataloguing this lot.